There are many job exchanges, but which are the best? A recent study provides a comparison. How do you find the best jobs and employees? If you want to compare job boards, you first have to know what you are comparing - otherwise it will be a bit like apples or pears. In general, one differentiates three different types of job boards, which are in strong competition with each other. The most popular genre, as we will see below, are the special job boards, focusing on a select group of job seekers and Company focus and are often industry specific. You could also say: class instead of mass. These include, for example, Randstad Professionals or chemie.de Careers. In contrast, general job boards publish job advertisements for all sectors, occupational groups, regions and career phases (graduates, young professionals, experienced professionals). Examples include Monster.de or Stellenmarkt.de belong. And there are job seekers such as Indeed or Careerjet, whose spiders scour employers' job pages for job ads and add them to their database index, then make them available to job seekers - much like the general Bing or Google search engines - for search queries deliver. But which are the best to find the right dream job - or as a company - the right employees? Answer is, as every year, CrossPro-Research Continuous Survey: The online survey is carried out since October 2008 as a joint project of PROFILO Rating Agency GmbH and Crosswater Job Guide. Both companies have been involved in e-Recruiting market research and market analysis for over 15 years. If you follow the results of the study for years, it quickly becomes clear that this time - as in every year - the job search engines in the ranking are rated better than the generalists in the job boards. The current results show that special jubblers are at the top of the list, with satisfaction (4,98) and search quality (4,78). 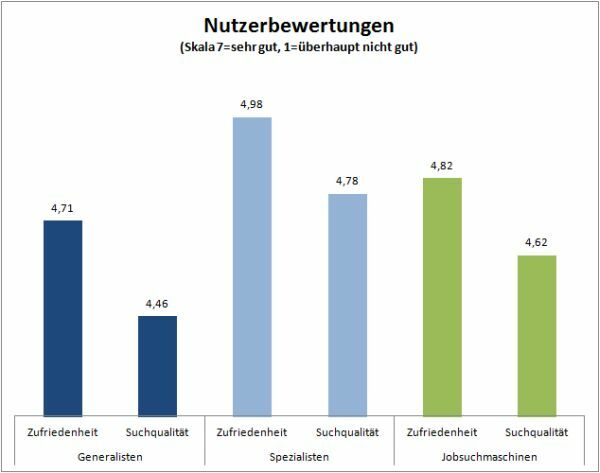 Then follow job search engines, the generalist job exchanges end up in third place (satisfaction 4,71, search quality 4,46). Right at the top of the ranking of the most popular job markets are the Jobfector, Yourfirm and Hotelcareer job boards. Among the generalists, Stepstone and Jobware are the top job seekers in the quality competition. In job search engines, Darmstadt-based Kimeta once again maintained its top position with an average satisfaction rate of 5,25, closely followed by Indeed with 5,07. Job interviews that surprise jobseekers: How do you rate the reactions? I always find these studies very interesting. - Need support for up to a week to serve or correct an ad. I think the study should be renamed, "Which job board has optimized on Google or shouted the loudest". I asked the creator of the study for feedback. What other approach to rating job boards would you suggest? In the case of the jobbörsen user survey of http://www.crosspro-research.com the survey participants (meanwhile via 43.000) rate their subjective assessment of the overall satisfaction as well as the search quality. Therefore, aspects such as free-time search (whether available or not) or search-finder (trainee, trainee, training jobs). Whether a job exchange takes a long time for an advertisement circuit, an applicant is relatively little interest. Google search engine optimization or the increase of the popularity level are meanwhile important home tasks. How else can you convince employers that job advertisements on your job exchange are also visited, found or read by applicants? What is really bad when a job exchange has a high reach?